ARES F45 F50 F60 F70 hydraulic cutting machine is 20T or 20 ton to 27T/28T or 27 ton/28 ton die cutting machine .It is the same as Gerson GR model clicker press, or swing arm cutting machine .You could see the below photo and details. 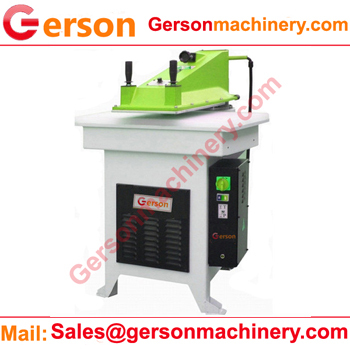 Gerson is the leading die cutting machine manufacture which focus on die cutting press machine more than 30 years.Gerson have their top technology and manufacturing for die cutting press machine. 1.The above hydraulic die cutting machine are used for cutting plastics ,fabric,leather ,paper ,cardbaord,MDF board,cork,foam ,sponge,film,eva,epe,pe etc., plastic and rubber material. 2.If you want to die cut out any shapes ,it is the right place for you .The die cutting mahcine is working with any shaped die molds (Gerson also can make the die molds for you). 3.If you need any custom requirement for your production ,Gerson have custom manual and automatic throughfeed and pushfeed the material to help you optimize the use of all raw materials for your unique production needs.And the cutting table size ,pressure ,stroke ,feed type etc., all can custom build .